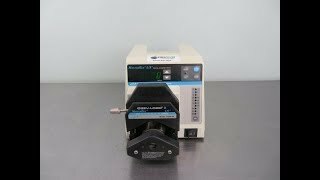 The Cole-Parmer MasterFlex L/S Peristaltic Pump offers an easy to operate reliable control pump that’s compact and precise. This digital pup drive has a speed of up to 600 RPM, with a flow rate of between 0.6 to 3400 mL/min, and can support up to two pump heads. This Peristaltic Pump is microprocessor controlled, allowing users accurate repeatable control over flow, refining calibrations and priming all from the intuitive membrane control pad. Users of this peristaltic pump can also refine to tube size being used, and store 1 user defined calibration in memory for frequently used parameters. This Masterflex L/S Digital Economy drive comes equipped and Easy-Load II pump head but is also compatible with Standard, Easy-Load, Quick Load, High-Performance, Cartridge, PTFE-Tubing, PTFE-Diaphragm heads. This Cole-Parmer MasterFlex L/S Peristaltic Pump have been fully tested and are performing to expectations. All of our lab equipment comes backed with our standard warranty. Should you have any questions, please don't hesitate to contact us.